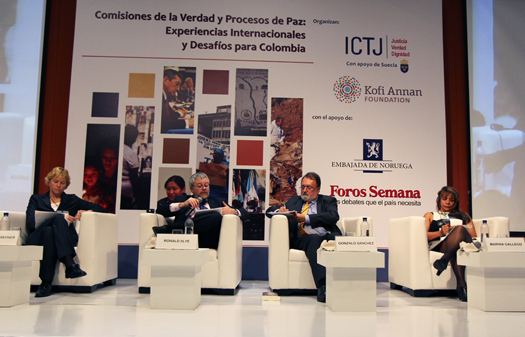 The last session of the conference, moderated by Gonzalo Sánchez, Director of Colombia’s National Center for Historical Memory, looked closely at the challenges facing a truth commission emerging from a peace process in a context like Colombia, where there is widespread and diverse social demand for truth. The discussion focused on the need for broad social participation and public dialogue if a truth-seeking experience is to be meaningful. Victims’ groups and women’s groups have been at the forefront of the movement for truth in Colombia. And more and more truth commissions around the world have recognized the need for inclusivity in their work, with special attention to the participation of marginalized groups, such as women, children, and the Indigenous. Gallego reflected on the unofficial truth commission her organization created in Colombia to investigate and analyze the experiences of women as direct victims of conflict, advocates for justice, and stakeholders in the peace process. Ruta Pacifica's many women activists have insisted that a peace process will not be complete without the voices of women. Truly the women's commission is an interesting example of a truth initiative led entirely by a civil society group to focus exclusively on the experiences of a single social group. The women’s stories of personal harm led to a discussion of issues of confidentiality and how a commission should handle sensitive information – in the short and long term – so as not to further victimize or endanger those who come forward to speak to a truth commission. “There is a problem or risk of what will happen to the information after the truth commission finishes its work,” she explained. Ronald Slye, Former Commissioner of the Truth, Justice and Reconciliation Commission of Kenya, also underscored the need for a truth commission to be as inclusive as possible to be effective. He also expressed concern that he does not know what happened to the documents and archives of the Kenyan truth commission. “Presumably the government has them,” he said. Priscilla Hayner, an independent consultant and writer, added to the consensus on the importance of active social forces in shaping a successful commission. She said, “Nobody says that any truth commission that has ever been created was perfect. But the strongest truth commissions have been those in countries where civil society has played a strong role." She acknowledged, "It’s hard to play an active role while the negotiations are happening in Havana, and not here in your country. But it's critical for the different negotiating parties to know what different people and groups in Colombia want."